Said Ladki is the associate dean for accreditation at the Adnan Kassar School of Business. 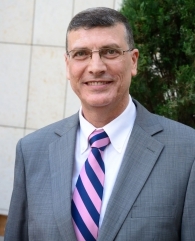 He was previously the school’s interim dean from 2013 to September 2018. Dr. Ladki pursued his college studies in the United States and holds a BS in Hotel and Restaurant Management with a minor in Business Administration from Oklahoma State University. In addition, he carries a PhD and an MSc in Hospitality and Tourism Management from the Pamplin College of Business in Virginia Tech. His research interests are focused on tourism, hospitality branding and food service. Dr. Ladki served as assistant professor at the faculty of West Virginia University, associate professor at Georgia Southern University and has been a faculty member at the Lebanese American University since 1996. He has published 30 scientific articles in leading international journals and 19 articles in the proceedings of the most important international conferences. He has also served on the editorial boards of three journals and continues to serve as an anonymous reviewer for named journals of his field. Similarly, he is a member of several professional and civic boards and is a consultant to various firms in Lebanon and the Middle East. Subcontracted by LAU’s Institute of Hospitality and Tourism Management Studies to consult in Saudi Arabia. Pente, A Saudi hospitality management firm that owns and operates variety of restaurants throughout the Saudi Arabia. Consulting educator at the World Tourism Organization (WTO Lebanon’s office). Consulting educator for the Lebanese Hospitality and Tourism Syndicates. Mr. Pierre El Achkar, President of the Union of Tourism Syndicates. Mr. Fadi Saab, Chairman and President of the Tourism Committee. Mr. Paul Ariss - President of Lebanon’s Restaurant Owners’ Association. Ladki, S.M. (2000). Human Resource Challenges Facing the Lebanese Hospitality Industry (2000). in Hoffman, S., Johnson, C. & Lefever M. (Eds.) International Human Resource Management in the Hospitality Industry ( pp.173-179) Educational Institute of the American Hotel & Motel Association. Ladki, S. M., Shatila, F. & Ismail, S. (2014). The Effect of Lebanese Public Transport on Visitors’ Satisfaction. Journal of Tourism Challenges and Trends, 7(2), 87-96. Ladki, S. M. & El Meouchi, P. (2013). Assessment of Coastal Resort Development: The Case of Lebanon. Journal of Tourism and Hospitality Management, 1(1), 36-43. Ladki, S. M., Mansour, K., Nassar, K., & El Zein, K. (2012). Mega Tourism Development Projects in the Middle East. Journal of International Management Studies, 12(4), 136-142. Itani, S. & Ladki, S. M. (2010). Women Leadership in the Arab World: The Case of Queen Rania Al-Abdullah. The Business Review, Cambridge, 15(1), 187-192. Ladki, S. M., & Misk, A. (2009). Airlines Competition in the Arabian Gulf: A Competitive Analysis. International Academy of Business Strategy, 9(1), 73-81. Ladki, S. M., Darwiche N., Baalbaki A., Talhouk M., Ghasham K., & Firikh, S. (2008). Assessment of the Lebanese Real Estate Market: A Content Analysis Approach. Romanian Economic and Business Review, 3(4), 84-96. Ladki, S. & Tamer, G. (2008). Internationalization of Menus: The Case of Lebanese Restaurants.Journal of Tourism Challenges & Trends, 1(2), 153-166. Ladki, S.M., Atallah, H., Hamam, F., Radwan, R. & Hariri, M. (2008). The Summer 2006 Lebanese Food Crisis: A Quality Of Life Perspective. Journal of Foodservice Business Research. 11(1), 96-103. Ladki, S.M. (2004). Dining Behavior Exhibited by Lebanese Consumers during the Month of Ramadan. Journal of Foodservice Business Research, 7(4), 111-125. Ladki, S.M., Sadik, M.W. (2004). Factors Affecting the Advancement of the Lebanese Tourism Industry. Journal of Transnational Management Development, 9(2/3), 171-185. Ladki, S.M., Sadik, M.W.(2003). Integration of Hotel Technologies: The case of Lebanon. The Journal of Applied Hospitality Management (PRAXIS), 4(4), 46-59. Ladki, S.M, Sadik, M.W., Zein, B. (2002). Effect of the Middle East Peace Process on Pan Arab Tourism Industries. Tourism Analysis, 6(3), 267-272. Ladki, S.M., Shatila, M.A. (2002). The Impact of Strategic Alliances on the Hospitality & Travel Industry Stakeholders Quality of Life. Journal of Transnational Management Development, 7(3), 13-25. Ladki, S.M., Mikdashi, T., Fahed, W., AAKSOBas, H. (2002). Arab Tourist and the Lebanese Vacation Ownership Industry: A Quality of Life Perspective. International Journal of Hospitality Management, 21(3), 257-265. Ladki, S.M. (1998). Comparative Cost Analysis of Lebanon Hospitality Services.Tourism Analysis, 3(3,4), 189-196. Ladki, S.M. & Dah, A. (1997). Challenges Facing Post War Tourism Development: The Case of Lebanon. Journal of International Hospitality, Leisure and Tourism Management, 1(2), 35-43. Ladki, S.M. & Beasley, J. J. (1996). The Restaurant Industry: A force for Diversity and Civil Rights. Hospitality and Tourism Educator, 8(1), 65-67. Young, W.C. & Ladki, S. M. (1996). Hospitality: A comparison of British and Jordanian Traditions. Journal of Nutrition in Recipe and Menu Development, 2(1), 43-58. Ladki, S.M. & Nomani, M.Z.A. (1996). Consumer Involvement in Restaurant Selection: A Measure of Satisfaction/Dissatisfaction (Part II). Journal of Nutrition in Recipe and Menu Development, 2(1), 15-32. Ladki, S.M. (1995). Consumer Involvement in Restaurant Selection: A Measure of Satisfaction/Dissatisfaction (Part I). Journal of Nutrition in Recipe and Menu Development, 1(3), 47-58. Ladki, S.M. (1994). Weight Control in the Workplace: A Needs Assessment for Food Service Professionals. Journal of College and University Food Service, 2(1), 29-38. Ladki, S.M. (1994). Wellness and Obesity: Implications for Health Care Costs Among Restaurant Managers. FIU Hospitality Review, 12(1), 81-89. Ladki, S.M. (1994). Strategies for Combating Fear of AIDS in the Hospitality Industry. Hospitality and Tourism Educator, 6(1), 75-77. Ladki, S.M. (1993). Hospitality Education: The Identity Struggle. The International Journal of Hospitality Management, 12(3), 243-251. Ladki, S.M. (1993). Students’ Attitudes Towards AIDS in University Food Service. Journal of College & University Food Service, 1(2):17-34, 1993. Ladki, S.M. & Gartner, W.C. (1992). Food Service Employers’ and Employees’ Attitudes Towards AIDS. Hospitality and Tourism Educator, 4 (3), 32-37.